For a full accounting see: "The Book of Broken Promises: $400 Billion Broadband Scandal & Free the Net"
Find Your City or State. While municipalities across the US are hankering to upgrade their communities, few, if any, know that they've been paying for fiber optic networks for decades -- that they never got. 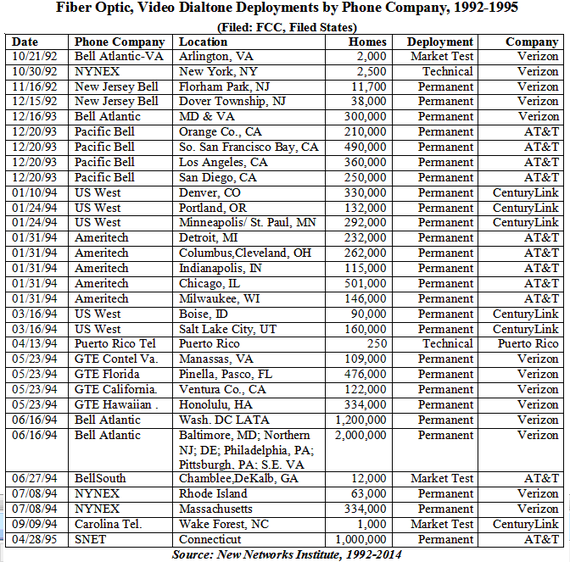 This chart details the "permanent" fiber optic 'video dialtone' deployments throughout America starting in 1992. By 2010 or there abouts, America was supposed to have been a fully-fiberized nation with fiber optic-based broadband utilities -- really. Starting in 1991, the phone companies went state-to-state to get changes in state laws, known as "alternative regulations" to charge customers for the replacement of the copper wires that were part of the state-based utility, like Verizon New Jersey, with a fiber optic wire capable of 45 Mbps in both directions, the standard speed for broadband in 1992. And though it varied by state, this fiber optic wiring was to be done everywhere -- urban, rural, and suburban, rich and poor communities and cities, and even the schools were to be wired in some states. All customers were paying for the upgrades of this future fiber optic broadband utility so they all deserved to be upgraded. And these "video dialtone" permanent deployments were the federal version of the state laws. And in fact, Bell Atlantic (now-Verizon) sued the FCC to be able to do these fiber optic swap-outs of the copper wire. However, these FCC filings were only a partial list of what was promised in every state. For example, by 2000, Verizon claimed it would spend $11 billion to have 8.75 million homes and businesses upgraded to fiber by 2000. Meanwhile, Pacific Bell of California (now AT&T California), claimed it would have 5.5 million households wired by 2000 and spend $16 billion dollars to do it. But this was all fiber-to-the-annual reports and press releases. 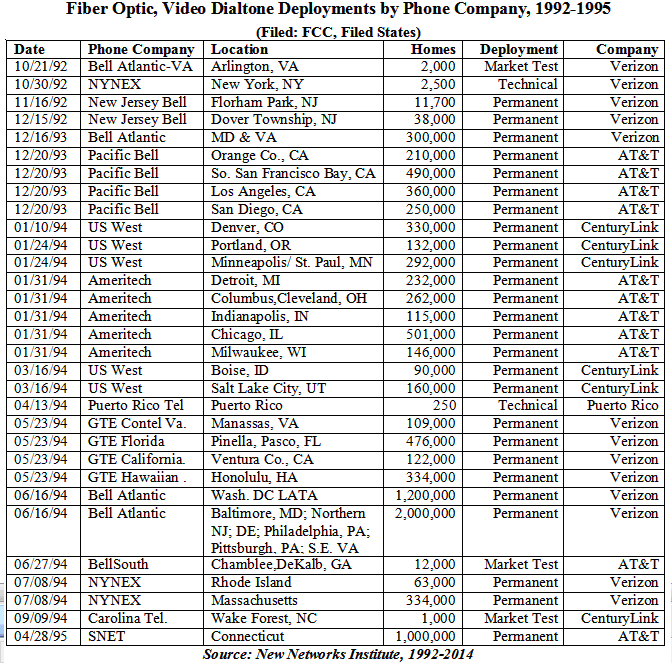 The telcos' video dialtone networks were never deployed, and virtually this entire list of millions of fiber optic broadband lines that were to be installed were abandoned. No state was wired, and in fact, most of the companies pulled a bait-and-switch and offered Digital Subscriber Line (DSL) service over the old copper wiring. But the state laws were never changed back and as far as we could ascertain, no state ever went back and got refunds or removed the "incentives" that charged customers for these upgrades, nor investigated the major tax perks. By the end of 2014, we estimate that $400 billion has been collected for this network infrastructure that was never deployed as promised as an upgrade of the state telecommunications utility networks by replacing the copper wiring with fiber optic cables to create a broadband utility for the delivery of voice, video and data services. Between 1993-1996 the combined companies took25 billion dollars in one-time tax deductions, claiming they were replacing the copper wires with fiber, even though it wasn't replaced. This was above and beyond other tax perks. 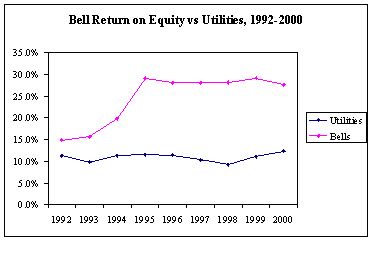 Starting in 1992 when the state alternative regulation plans were being implemented, through 2000, the Bell companies' return on equity (profits) went from an average of 14 % to 29% - a 107% increase. These increases were 188% above the other Utilities. (Source: Business Week Scoreboards, 1993-2000) I.e., instead of using the money for new construction, it somehow ended up as just more profits. Virtually no one has a clue that they have been and continue to pay for these upgrades (if they had phone or any service from the incumbents, now-AT&T, Verizon and Centurylink). And these increases were on all business and residential services, as well as services used by municipalities, schools, etc. The FCC entirely erased this history of fiber optic broadband in America. No "Advanced Network" report (based on a requirement of Section 706 of the Telecommunications Act of 1996 to see if broadband was being deployed in a timely fashion) ever included the state-based fiber optic-based obligations or the fact that customers have been paying extra for network upgrades since the 1990's. There have been multiple additional rate increases for broadband over the last two decades, and no government agency has ever done a full accounting of the monies collected or the failure of the deployments. We're all still paying for this in many ways -- We are 29th in the world in broadband in download speeds and 43rd in upload speeds, according to Ookla. AT&T's entire U-Verse is a copper-to-the-home service, (it is fiber-to-the-node, (FTTN) i.e., fiber within ½ mile of the location) and Verizon's FiOS is fiber optics but the company has stopped deployments. By 2014, the speeds should have evolved to gigabit offerings as the standard in 1992 was 45 Mbps in both directions. And they have us coming and going. We have been also overcharged for broadband upgrades (and the wiring of schools for high-speed Internet) by the cable companies. In 1995 the FCC cut a deal with Comcast, Time Warner and the other cablecos, actually called "The Social Contract"; the companies could charge up to $5.00 a month to upgrade their networks and supply high speed Internet to schools for free or at cost. This Contract expired in 2000 and yet there is no evidence this 'temporary' charge was removed or that they wired the schools for cable modem service. Industry-wide, that's $300 million a month, $3.6 billion a year, for 14 years -- about $50 billion extra, over $800 per household -- but who's counting? Let's hear from one of those who failed to come through -- Now-Verizon. I'm personally tired of people, especially the telco-paid pundits, astroturf groups, et al who claim there were no commitments, no changes in state laws and no monies collected. I give you Bell Atlantic's 1993 Annual Report (now Verizon) to shut up the naysayers, followed by a Bell Atlantic 1996 press release about fiber-to-the-curb to have 12 million homes and business wired by 2000. Bell Atlantic (including the merger with NYNEX), controlled the East Coast from Maine through Virginia, (with the exception of most of Connecticut). I note that "The Book of Broken Promises" was written to document this broadband scandal, one of the largest telecom scandals in history. We left the complete quotes. They give the history of fiber optic broadband, the legal actions to offer video on phone lines (video dialtone), the announced commitments, including monies to be spent, and Verizon's ability to get changes in regulations to give them more money and profit that should have been used to replace the copper wiring of state-based utility with a fiber optic future. And this proves that America was supposed to be a leader in fiber optic deployments starting in 1993 -- over 21 years ago-- but who's counting? "First, we announced our intention to lead the country in the deployment of the information highway. "In December, we issued our technology requirements to potential suppliers for a new video-capable technology platform that will accelerate our entry into attractive markets for entertainment and interactive multimedia services. We expect Bell Atlantic's enhanced network will be ready to serve 8.75 million homes by the end of the year 2000. By the end of 1998, we plan to wire the top 20 markets in our Mid-Atlantic region. These investments will help establish Bell Atlantic as a world leader in what is clearly the high-growth opportunity for the 1990s and beyond--interactive, multimedia communications, entertainment and information services that address the vast, unfulfilled demand for customer choice, convenience and control. "We will spend $11 billion over the next five years to rapidly build full- service networks capable of providing these services within the Bell Atlantic region. What's more, we will expand Bell Atlantic's global presence by developing attractive investment opportunities in Europe, Mexico and the Pacific Rim. "In 1987, the FCC initiated an inquiry into whether developments in the cable and telephone industries warranted changes in the rules prohibiting telephone companies such as the Network Services Companies from providing video programming in their respective service territories directly or indirectly through an affiliate. "In November 1991, the FCC released a Further Notice of Proposed Rulemaking in these proceedings. In August 1992, the FCC issued an order permitting telephone companies such as the Network Services Companies to provide "video dial tone" service. Video dial tone permits telephone companies to provide video transport to multiple programmers on a non-discriminatory common carrier basis. The FCC has also ruled that neither telephone companies that provide video dial tone service, nor video programmers that use these services, are required to obtain local cable franchises. Other parties have appealed these orders, which remain in effect pending the outcome of the appeal. "In late 1992, Bell Atlantic - New Jersey entered into agreements pursuant to which, pending regulatory approval, it would provide video dial tone transport services to two video programmers in New Jersey. As contemplated by its contract with Sammons Communications, Incorporated ("Sammons"), Bell Atlantic -New Jersey will deploy fiber optic technology that will enable Sammons and other video information providers to deliver video programming in three Morris County, New Jersey communities over a video dial tone platform. Bell Atlantic - New Jersey's contract with Future Vision of America Corporation ("Future Vision") contemplates that Bell Atlantic - New Jersey will deploy fiber optic technology in the Dover Township, New Jersey telephone network to establish a video dialtone platform that will allow Future Vision and other video information providers to deliver competitive video programming services in that community. Applications for approval to deploy these video dial tone systems are pending at the FCC. "In December 1992, Bell Atlantic - Virginia and Bell Atlantic Video Services Company filed a lawsuit against the federal government in the United States District Court for the Eastern District of Virginia seeking to overturn the prohibition in the Cable Communications Policy Act of 1984 against LECs providing video programming in their respective service areas. In a decision rendered in August 1993 and clarified in October 1993, the court struck down this prohibition as a violation of the First Amendment's freedom of speech protections and enjoined its enforcement against the Company, the Network Services Companies and Bell Atlantic Video Services Company. This decision has been appealed to the United States Court of Appeals for the Fourth Circuit. "In early 1993, the FCC granted the Company authority to test a new technology known as Asynchronous Digital Subscriber Line ("ADSL") for use in delivering video entertainment and information over existing copper telephone lines. Beginning in March 1993, the Company began a one-year technical trial of ADSL serving up to 400 Bell Atlantic employees in northern Virginia. In the Fall of 1993, Bell Atlantic petitioned the FCC for authorization to expand and convert this technical trial, upon its completion, into a six month market trial serving up to 2,000 customers. Bell Atlantic also requested authority to offer a commercial video dial tone service to customers served by 25 central offices in parts of northern Virginia and southern Maryland upon completion of the six month market trial. These applications are pending at the FCC. "Third, we continued to make major strides in the public policy arena toward achieving the freedoms necessary to compete. "Last summer, the state legislatures in Pennsylvania and Delaware authorized new regulatory frameworks that, when implemented, will give us the incentives to invest in new technology and services that will meet customer needs and provide long-term growth opportunities in a competitive environment. Plans for similar alternative regulation have been approved or are pending in all seven state jurisdictions. Moreover, all telephone subsidiaries have been afforded some degree of pricing flexibility for products and services subject to competition. "Perhaps the most significant public policy development last year was our successful challenge to the provision of the 1984 Cable Act that prohibits Bell Atlantic from providing video programming in its traditional service territories. The District Court ruling opens lucrative new markets for Bell Atlantic as it expands consumer choice. It may prove to be a forerunner of even more change, as legislation proposing to lift remaining barriers to our full participation in the information marketplace makes its way through Congress." This hype of a fiber optic future was still going on in 1996. Here are sections from a 1996 Bell Atlantic press release about fiber-to-the-curb deployments -- 12 million homes and businesses were to be completed by the end of the year 2000 -- Stop laughing. This was done as a broadband 'carrot' to make sure that the Bell Atlantic-NYNEX merger closed -- and it worked. "ARLINGTON, VA. -- Bell Atlantic Corp. [NYSE: BEL] has selected Lucent Technologies Inc. [NYSE: LU] as a supplier of key network components for Bell Atlantic's initial Full Service Network deployment in the mid-Atlantic region. Bell Atlantic's investment under the contract could reach several hundred million dollars over a six-and-one-half-year period. "Later this year, Bell Atlantic will begin installing fiber-optic facilities and electronics to replace the predominantly copper cables between its telephone switching offices and customers. Fiber-optics provide higher quality and more reliable telephone services at lower operating and maintenance costs. The company plans to add digital video broadcast capabilities to this "fiber-to-the-curb," switched broadband network by the third quarter of 1997, and broadband Internet access, data communications and interactive multimedia capabilities in late 1997 or early 1998. "We also will be able to more quickly meet our customers' demands for a variety of new services -- including additional phone lines, high-speed data connections to on-line services and the Internet, and video and interactive services. A wide range of content providers -- including Bell Atlantic Video Services, which will work with our programming and systems venture TELE-TV -- are expected to supply a variety of interactive multimedia services for this platform." "Lucent Technologies will supply the local network hardware and software components required between Bell Atlantic's switching offices and customers' homes or small businesses. BroadBand Technologies [NASDAQ: BBTK] of Research Triangle Park, N.C., will work with Lucent Technologies, providing switched broadband network components. Bell Atlantic will be the systems integrator for its Full Service Network. "The fiber-to-the-curb architecture that Bell Atlantic will build is the next step in the company's ongoing, aggressive network modernization program. Bell Atlantic's network infrastructure includes digital switching covering more than 90 percent of the company's service area, as well as widely available advanced calling features and high-speed data communications services such as ISDN [Integrated Services Digital Network]. In addition, the company's switched broadband network in Dover Township, N.J. -- the first commercial video dialtone network in the country -- allows a video programmer, FutureVision, to offer digital broadcast services in competition with the local cable television company. "Bell Atlantic plans to begin its network upgrade in Philadelphia and southeastern Pennsylvania later this year. The company plans to expand this Full Service Network deployment to other key markets over the next three years. Ultimately, Bell Atlantic expects to serve most of the 12 million homes and small businesses across the mid-Atlantic region with switched broadband networks." These deployments were NEVER EVER BUILT in any state and now-AT&T did the exact same thing. So let me conclude by summarizing and parsing all of this. Deregulation to build a fiber-based broadband utility in almost every state just ended up giving the telcos more profits. Bell Atlantic, in all of its states, pitched "alternative regulation" which gave them 'pricing flexibility' and 'incentives to invest' - buzz words for tax perks and rate increases. The outcome -- profits went from 14% to 29%, on average, after the deals went through. America lost a decade of fiber optic deployments from 1992-2005. We were promised fiber; we paid for fiber, and got a bait-and-switch with DSL over copper. Worse, starting in 2005, there was a new wave of rate increases on basic phone customers -- to pay for upgrades, as seen with Verizon NY, where there were three separate increases on residential phone customers to fund "massive deployment of fiber optics" (and it was done because it was classified as something called "Title II'). Insult to injury -- In 2005, AT&T rolled out U-Verse over the old copper wires (copper-to-the-home), that were never replaced, claiming it was 'fiber-based'. Verizon started fiber optic deployments in 2006, even though every state had previous commitments and billions were collected by state. Worse, Verizon announced it had stopped deployments around 2010 with about 50% not getting upgraded but having paid additional rate increases. There was NO memory of the previous commitments that happened in 1992-2005 and no tracking of the built-in 'extra' monies for broadband, just new rate increases. Punchline: You paid thousands of dollars for a state-based fiber-optic-based utility; you paid for a Ferrari on the Information Superhighway and they gave most of us a skateboard on a dirt road. Punchline: And cable? If you had service since 2001 you were overcharged about800.00 and counting. What happened in your community? Your state? But it gets worse: Next up: Verizon's Financial Shell Game Exposed.